Isagenix is taking over the UK, and it’s your time to get in on the action. Whether you’re new to Isagenix or a current customer interested in taking advantage of its incredible income potential, your financial future and quality of life can be forever changed! Isagenix is a global leader in the network marketing and wellness industries. From the U.S. to Australia and now right here in the UK, Isagenix is transforming the world one healthy and financially independent person at a time. The company’s success lies in its belief in providing nothing but the very best health, wellness, and performance products to consumers across the globe. With an unbelievable support structure as well, Isagenix is truly changing the lifestyles of thousands of customers worldwide. In an effort to reward members who believe in the power of Isagenix and share their products with others, Isagenix has developed an outstanding compensation plan that ranks tops in the industry. Best of all, as the company continues to grow and evolve, the perks of being an Associate just keep getting better. The direct selling and network marketing industries are designed to provide ordinary people with the chance to earn extraordinary income. Unlike traditional income, as an Isagenix Associate, you get paid residual income every week for orders placed by people in your downline. We have teams across the world including Australia, Canada, USA, New Zealand, Malaysia, Singapore, England, Wales, Scotland and Northern Ireland. Keep in mind, these are U.S. stats. Global stats, including the UK, are even more amazing! Whether your goal is to build muscle, lose weight, boost your health, improve your performance, live healthier, or earn a nice extra income, Isagenix encourages everyone to begin as a Customer in order to experience without bias the true power of their products. At first glance, any network marketing company’s compensation plan can be a little confusing. If you need help with any of the below, please contact us and we’ll happily assist. The Isagenix Team Compensation Plan was developed to encourage people to help each other accomplish their financial goals. This philosophy coupled with Isagenix’s popular, scientifically proven products has made it one of the most powerful compensation plans in the direct selling and network marketing industry. Upon enrollment as an Isagenix Associate, you’ll be assigned a spot in your sponsor’s organisation. Each Associate’s organisation is comprised of two legs: a Left Sales Team and a Right Sales Team. Regardless of which leg you’re on, as an Associate, your compensation will primarily come from product sales by others in your marketing organisation. As your organisation grows and more products are sold, more money will be earned. Team Bonuses form the foundation of the Isagenix compensation plan. When you reach the ranking of Consultant or higher, you become eligible to qualify for Team Bonuses based on your performance and your team’s product sales. 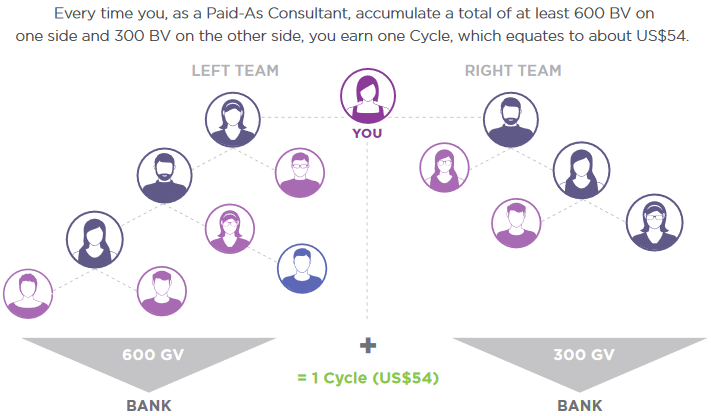 To earn a Team Bonus, simply accumulate 900 or more BV (business volume), with a minimum of 300 BV from the Left or Right Sales Team and at least 600 BV coming from the other. This is called a Cycle. You can earn several Cycles daily and up to 250 Cycles each week. At Isagenix, the earning possibilities are truly endless! To give you an estimate of business volume, the Weight Loss Premium Pack is 307 BV, and the 30 Day Weight Loss System is 193 BV. Note: You do NOT need to be a direct sponsor to take advantage of a team member’s BV. For example, if I enrol you, and you enrol Joe, I still get the BV from Joe’s purchases (both his initial signup, and any future orders). Likewise, if I enrol you and then enrol Mary after you on the same leg/team, you get BV from Mary’s initial and future orders. That’s right, even though you did not sign up Mary, because she is placed in your team, you benefit financially from her! When you sign up as an Associate, you’ll get your own replicated website (the same as this one). If you direct customers to order from your replicated website, you’ll receive retail direct profits (anywhere from 20 to 30% of the purchase price). These profits are paid weekly and allow Associates to earn on near autopilot simply by following a proven system. Product Introduction Bonuses, or PIBs, are earned by sharing certain qualifying systems or packs with new Isagenix Members, who then purchase the system or pack on their very first order. The bonuses vary depending on the product system or pack purchased, but they can be quite lucrative. For example, if you sign up a customer on a Weight Loss Premium Pack, you’ll earn a bonus of £66! Active Isagenix Executives are able to receive a Matching Team Bonus of 10% with each weekly Team Bonus for every personally enrolled Associate with the rank of Consultant or above. As an Executive, you can earn up to 250 Executive Matching Team Bonuses per week. For example, if you have 12 Consultants on your team and they combine for 150 cycles between them, you’ll get paid a bonus of 15 cycles! Isagenix often offers additional promotions and incentives to reward Associates for sharing the transformational power of Isagenix products with others. Some of the most popular promotions and incentives include Leadership Pools, Rank Advancement Bonuses as well as the IsaDerby and IsaBody Challenge. By participating in the IsaDerby competition in international markets, we’ve already won numerous 5-star, all expenses paid trips to Mexico, Las Vegas, San Diego, Borneo and Cambodia! Win Holidays with the Isagenix Business! If you want to participate in the Isagenix compensation plan and build a successful business like so many before you, you must apply to be an Isagenix UK Independent Associate. This is the first step. To apply, simply login into your Isagenix Customer BackOffice and follow the steps. You can also contact me to help get you started. After all, I’m here to help! As an Associate, you’ll receive a personal Isagenix website to share with others and directly sell Isagenix products. You’ll also receive exclusive training from both the Nutritional Cleanse UK team, and the wider Isagenix UK team. You can move on from Associate status and become a Consultant by actively sharing Isagenix products via the “You Share, They Share, Repeat” system. Simply use the system to accumulate 100 PV (personal volume) and maintain at least 100 BV (business volume) from personally enrolled members on both the Left and Right Sales Teams within a 30-day period. That’s all there is to it. Once you become a Consultant, you’ll receive a Rank Advancement Bonus of US$100 for each personally enrolled Associate who also earns Consultant status. As a Consultant, you also become eligible for Team Bonuses. Once you become a Paid-As Consultant, you can qualify to become a Manager by having a minimum of two personally enrolled Associates who also achieve Paid-As Consultant status within the prior month. To do this, you simply share Isagenix products with others who follow your lead and do the exact same thing. In addition to the many earning possibilities and benefits of being a Consultant, as a Manager you also become eligible for the Holiday Bonus Pool, allowing you to earn bonuses for specific yearlong activities. Plus, if you become a Manager within your first 60 days of being an Associate, you’ll become a Crystal Manager and enjoy a $US250 promotional bonus. You can qualify to become a Director with Isagenix by being a Consultant and having six or more personally enrolled Associates who also become Consultants. In addition to the many benefits and earning opportunities of being a Manager, you’ll also become eligible for the Director Pool promotion and have the opportunity to become a Crystal Director. When you earn Crystal Director status, you’ll also receive a $US750 bonus for having six or more personally enrolled Consultants on your Isagenix team within a four-month period. The final step in your ascension to Isagenix success is the rank of Exectuive. To become an Executive, you must have a minimum of 10 personally enrolled Associates who reach Consultant status within 30 days. 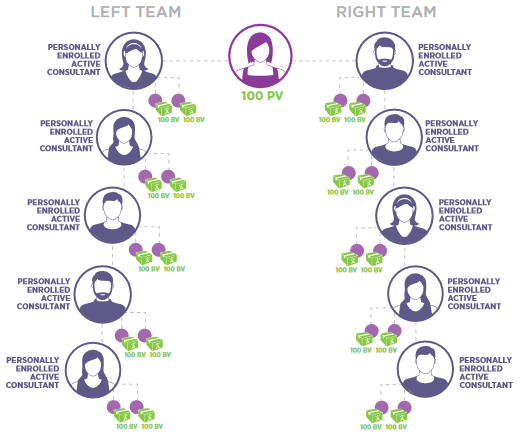 At least five of the Consultants must be on the Left Sales Team and at least five must be on the Right Sales Team. If you’re able to do this and achieve the Executive ranking within your first 180 days as an Isagenix Associate, you’ll also receive the rank of Crystal Executive and a $US1,000 promotional bonus. You can also become eligible for Executive Leadership Pools and Executive Team Matching Bonuses in addition to the many benefits and earning options available as a Director. By sharing and earning as an Executive, you can also qualify for a re-entry position and earn Platinum status, which offers even more earning power and a bevy of benefits outside of the standard Isagenix compensation plan. Each of these ranks offers certain benefits and privileges. The more you share, the more you sell. The more you sell, the more you make and the higher you rank. It’s as simple as that. When you become an Isagenix Associate with our team and earn your first commission, Isagenix will automatically set you up with a convenient electronic payment account, known as IsaWallet. Isagenix will deposit your commission and bonus pay directly into your IsaWallet account. Similar to PayPal, you can then transfer the money directly into your personal bank account. Best of all, Isagenix pays weekly, not months down the road! We’re the world’s #1 Isagenix enroller. This means more people in your downline so you have the ability to earn more team bonuses/cycles. We have extensive training systems in place. We’re committed to make your Isagenix UK business a success and you’ll have access to exclusive Facebook groups, weekly team calls, social media training, online marketing funnels and more. You have the ability to market internationally in other countries you may have family and friends (such as Australia, New Zealand, USA, Canada and various parts of Asia). We’re on hand 24/7 to help.